By Kori ~ September 8th, 2011. Would you like a quick suggestion for a good wine to drink tonight (or this weekend) that wonâ€™t break your budget and is widely available? Many of our readers have said this is something they would like, so here is this weekâ€™s selection, the 2009 Boomtown Cabernet Sauvignon from Washington State. Boomtown is the entry-level value brand produced by Dusted Valley Vintners. Dusted Valley Vintners, located in Walla Walla, Washington, was founded in 2003 by brothers-in-law Chad Johnson and Corey Braunel who are co-owners and co-winemakers. Both Chad and Corey are originally from Wisconsin and are proud cheese-heads. In fact, they bring a bit of Wisconsin to Dusted Valley by using barrels made from Wisconsin oak to age their wines. They also have a tasting room in Woodinville near the Hollywood Schoolhouse for those on the west side of the mountains who cannot make frequent trips to Walla Walla. 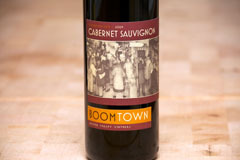 2009 Boomtown Cabernet Sauvignon (Washington State): 94% Cabernet Sauvignon and 6% Petit Verdot. Dark purplish red. Aromatic with black currant, black cherry, oak, smoke, and licorice on both the nose and palate. Medium to full-bodied with medium, dry tannins, and a long, smooth finish.